Night at the Museum is our quarterly after-hours social event and occur on a Wednesday evening in February, May, August, and November. During the work week, museums (including Mabry-Hazen House) mostly keep bankers' hours and weekends are often packed with other activities, making it difficult for people who hold day jobs but would like to visit more often. 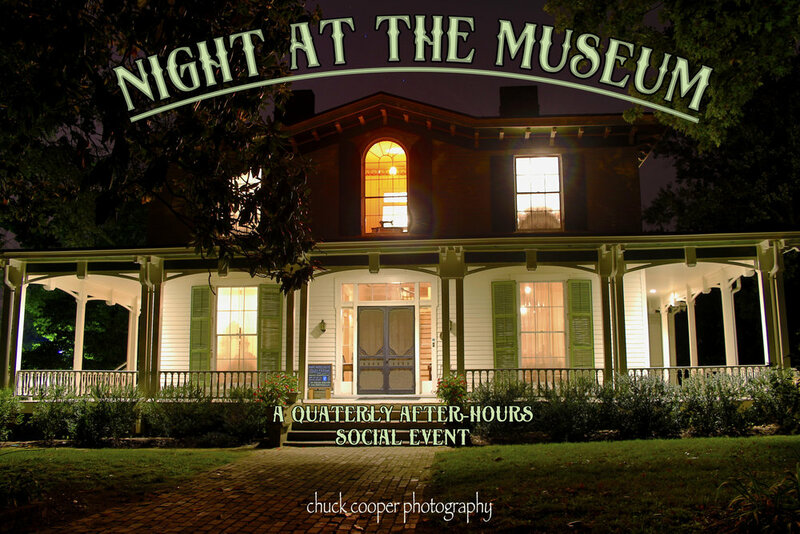 Night at the Museum is a chance to visit Mabry-Hazen House after-hours on a weekday and drink up a little history. Explore the 1858 historic house in an entirely different light as twilight falls upon Mabry’s Hill, watch the sun set behind Sharp’s Ridge and North Knoxville flicker alight, all while enjoying drinks provided by local breweries and saloons. Tickets are $10 per adult and visitors under 18 are free. Each purchased ticket includes two adult beverages and additional drinks are $5. The historic home is open for self-guided tours. Food will be available for purchase. All proceeds benefit Mabry-Hazen House. Event occurs rain or shine. PURCHASE TICKETS BY CLICKING ON THE DATE. Volunteers clean-up the front beds during the 2018 Park Day at Mabry-Hazen House. On Saturday, April 6, 2019, history buffs, community leaders and preservationists will team up with the American Battlefield Trust at more than 155 sites in 32 states to answer the call to service on Park Day. Celebrating its twenty-third year, Park Day has attracted volunteers of all ages and abilities bound by their dedication to serving their communities at historic sites nationwide. Mabry-Hazen House will participate in Park Day on Saturday, April 6, 2019, from 9am to 3pm. Activities will include mulching, removal of invasive plants, washing the historic house, planting flowers, preparing the garden beds, and general spring-cleaning. Some tools will be provided, but volunteers are encouraged to bring rakes, pitchforks, tarps, and similar yard tools. The American Battlefield Trust is the largest and most effective nonprofit organization devoted to the preservation of America’s hallowed battlegrounds. Although primarily focused on the protection of Civil War battlefields, through its Campaign 1776 initiative, the Trust also seeks to save the battlefields connected to the Revolutionary War and War of 1812. To date, the Trust has preserved close to 43,000 acres of battlefield land in 23 states. For a complete list of participating Park Day sites, visit Civilwar.org/parkday. Water and refreshments will be provided. We also will have a limited number of free Park Day t-shirts for volunteers! RAIN DATE WILL OCCUR THE FOLLOWING SATURDAY, APRIL 13, 2019. Additional information about the event can be obtained by calling 865-522-8661. Please RSVP by April 1st. Sign up here. Visitors chat with board member, Karen Peterman, during the 2018 Tennessee Statehood Day event at Mabry-Hazen House. June 1, 2019 marks the 223rd anniversary of Tennessee’s admission into the Union as the 16th state. The Historic Homes of Knoxville have partnered to celebrate Statehood Day on June 1st. These sites include places of historical significance in the exciting journey from the creation of our country to the founding of our state. The Historic Homes of Knoxville include: Blount Mansion, Crescent Bend, James White’s Fort, Mabry-Hazen House, Marble Springs, Ramsey House, and Historic Westwood. Each site will have individual ways of celebrating the birth of Tennessee. This is a FREE museum day to the public. Mabry's Hill, at 230 feet high, is the highest hill north of the Tennessee River, offering a great view of the Fourth of July fireworks. Mabry-Hazen House is hosting an old-fashioned Fourth of July front porch celebration on Thursday, July 4th, 2019. Gather with us to celebrate Independence Day, the Declaration of Independence, and community. Enjoy great views, good food and beer, live music, and tours of the 1858 house for $10. Bring your lawn chairs and blankets and spread out on our 7 acres of greenspace near downtown and right off I-40. Overlooking downtown Knoxville to the west and the Great Smoky Mountains to south, historic Mabry's Hill enjoys a spectacular view of the City of Knoxville's Festival on the Fourth fireworks. Launched from Henley Street Bridge, the western side of Mabry's Hill offers an unparalleled panorama of the firework show. Avoid the downtown traffic and take it easy with this laid-back celebration. It is the perfect time to come chill on the hill! We'll also have several activities for kids and the young at heart including sack races, seed spitting contests, three-legged races, bocce, croquet, corn hole, and much more. A moment from A Victorian Seance Experience. As the evenings get darker and the first hint of winter hangs in the air, the western world enters the season of the dead. It is time when restless souls, vengeful spirits, and mythical creatures can more easily cross the plane between the two worlds. With All Hallowed Eve’s approach, it is a time when ghost stories and haunted tales more easily cross into the realm of our daily lives as these accounts help us remember the dead and contend with the unexplained. Along with the historic buildings, grounds, and family history, Mabry-Hazen House also preserves a darker history of Americans' experiences with death, funerals, spiritualism, and the occult and this year the museum will exhibit those macabre, yet fascinating cultural moments during their Victorian Séance Experience. Under the guidance of a Victorian medium, the séances will follow the rituals of nineteenth century Spiritualism and investigators will participate in historic “demonstrations” of mediumship. Whether true manifestations of spirits or clever parlor tricks, sitters at the séances will learn about this eerie, yet ubiquitous aspect of 19th century American life. Séances will occur every 20 minutes starting at 6:00 pm and ending at 10:00pm. Guests must select a specific date and time to reserve their seat. They should arrive 15 minutes before their table reservation. Each session is limited to 8 guests, tickets must be purchased in advance, and all sitters must be 16 or older. Tickets are $20 per person. In addition to the séances, psychics, astrologers, and tarot card readers will be perform their craft for interested parties. Once a séance concludes, guests may purchase $5 vouchers to exchange to have their fortunes told. Guests gather for lunch during the 225th Anniversary of the City of Knoxville. The Historic Homes of Knoxville are pleased to invite the public to a luncheon on Wednesday, October 2, 2019, at 11:30 AM at the East Tennessee History Center to celebrate the founding of the City of Knoxville 228 years ago. Knoxville's key leaders will come together to celebrate and promote the city and its most precious properties, including Blount Mansion, Crescent Bend House and Gardens, James White's Fort, Mabry-Hazen House, Marble Springs State Historic Site, Ramsey House, and Historic Westwood. Proceeds from the luncheon will benefit the joint promotional activities of the Historic Homes. A peek into music parlors during our 2017 Christmas Tours. Mabry-Hazen House invites you to join us for our annual Christmas Tours. Our final event of the year before we close for the winter, the rooms of the house will be decorated in the spirit of the holiday season. Tours are scheduled for Saturday, December 7th from 5-8pm and Sunday, December 8th from 2-5pm. We ask for a suggested donation of $5 for non-members. Children under 13 and members are free of charge. Historically-inspired light refreshments will be served. Donations are encouraged and appreciated. Mabry-Hazen House will be open by appointment from December 16th, 2018 until March 1st, 2019.